Since we had, in previous years, traveled by motorcycle through all the States West of Illinois, a lot of the States in our immediate vicinity, and the Provinces of Canada from Quebec to British Columbia, we became determined to work on a goal of riding our motorcycle in all the contiguous United States and all the Provinces of Canada. To accomplish that goal, we needed to ride in some States and Provinces to the Northeast and some States in the Southeast. A bit of calculation made it clear we would not be able to do all that in one vacation, so we decided to head Northeast this year and plan to complete our goal with a ride through the Southeast States next year. We planned our trip through Washington DC, the New England States and the five Canadian Maritime Provinces of New Brunswick, Nova Scotia, Prince Edward Island, Newfoundland and Labrador. We read some information about the Maritimes and how the weather could often be foggy, drizzly, and rainy, but could change to sunshine again very quickly. Our Garmin 376C GPS had the NEXRAD weather radar service, so we should have advance warning about any inclement weather we might face. The International BMW Rally was scheduled for July 20 to 23rd in Essex Junction, Vermont, and since we were going to be in the area anyway, spending a couple of days there worked into our travel plans. 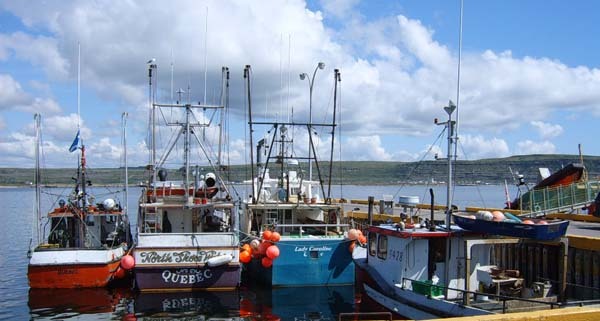 These picturesque fishing boats were docked in Labrador. The distant hills are typical of the stark landscape there. Notice the small fishing village that can be seen a short distance in from the right side of the picture.